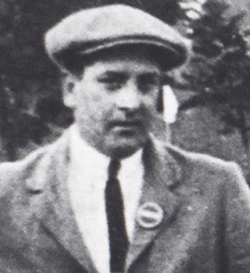 Albert Joseph Brazington, known as Bertie, was born in Frampton in 1879, the younger son of Edward Brazington, a waterman, and Anne (or Annie) née Bullock. The family lived in Saltwater Row (now Hart's Cottages). Bertie's mother died in 1901 and his father in 1908. By 1911 he was working as a gardener and lodging in a property belonging to the Estate. Bertie enlisted with the 1st Garrison Battalion of the Worcestershire Regiment on 7 June 1917 at Stroud. He only served as a private for 152 days, for he had a long-term tubercle (an outgrowth) on his right ankle which gave him impaired movement. He was awarded the Silver War Badge to indicate his honourable discharge from service. Bertie fell in love with Lilian Annie Clifford of The Grange, the elder sister of Edith Katherine, Henry Francis, Mabel Constance and Elaine Annie. Although Lilian's mother disapproved of the liaison, Lilian and Bertie lived together for many years in a caravan behind The Grange. Lilian broke her hip and subsequently died of heart failure on 10 September 1937; it is said that Bertie died of a broken heart nine days later. Lilian's sister Mabel (a District Nurse) registered his death, giving her relationship as cousin, meant in this context as a member of his wider family. Albert Joseph Brazington was buried in St Mary's churchyard.